After yesterday’s fantastic day, today it was, unusually, the turn of the Sunday Soarers to suffer. 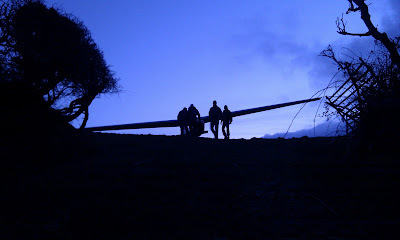 Although the easterly wind continued, which spurred their optimism, there was little sign of any wave, as splodges of grey cloud rolled in not much higher than the tops of the moors and spread from horizon to horizon, with just the occasional glimpse of blue revealing a downward part of the cascade, or flat lenticular in the distance. Indeed, the only solace to the faithful band was that the wind was, for once, straight down the runway giving smooth and uncomplicated launches to 1300ft plus with no need for the winch man to worry about retrieving the cable and parachute. 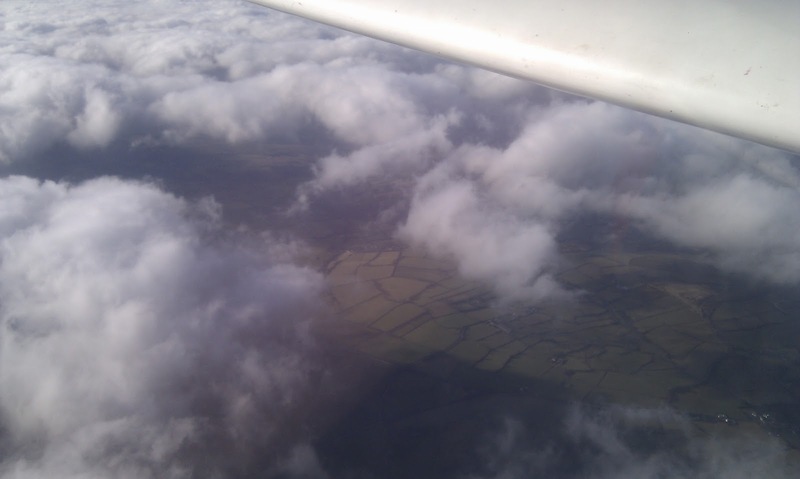 This allowed trainees Dave Parker and Sam Deeks to get in some valuable approaches to land, unfettered by the burden of having to lay off for a crosswind. Also, beneath the overcast, there was some evidence of wave, both to north and south of the site, in narrow, knife edge lines, enough to enable solo pilots Roger Applebloom, Barry Green and Nigel Williamson to just about scrape double figures. Highlight of the day was the return of Bob Sansom who, having recently re-soloed, was keen to get his immaculate K-8 back into the air, which he duly did, to the tune of a 1,500ft launch courtesy of Barry Green. After 3 of those, however, even Bob’s enthusiasm for being catapulted into the grey began to flag, and as sleet began to fall we decided that conditions were not going to improve. Then just as we were putting the gliders away Roger Green arrived to announce that conditions at Tiverton were ‘booming’, so let’s hope that gliding folk in the Mendips and further up country had a better day of it. Thanks go to Nigel and Barry for their launching, to Heather for driving retrieve, and to Colin Boyd, whose previously reported wiring up of the Launch Assistant into K-13 DMX proved to be successful … yes, it WORKS! The day started with a beautiful blue sky and a fairly gentle easterly breeze. The day looked stunning from indoors. Outdoors it was COLD, in fact, VERY COLD. Still this would surely assist thermal formation; after all, it is only the difference in temperature that matters. 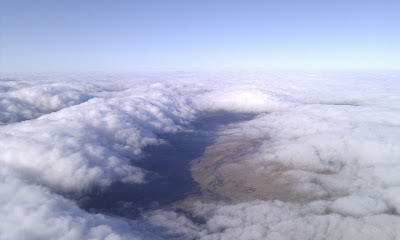 The cloud streets formed early and worked much better than they looked. 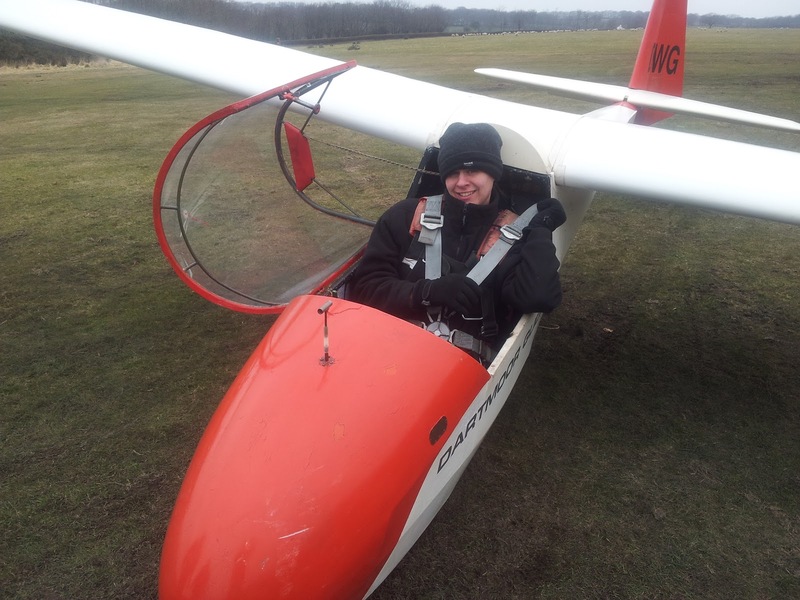 Will Wilson returned from his usual winter hibernation in India, took a 16 minute check ride with CFI Don Puttock, jumped in the Zugvogel and promptly soared for 2 hrs 10 minutes to claim his 2 hour flight to complete his Cross Country Endorsement. Well done Will and welcome to the world of the licenced glider pilot. The soaring was brilliant. There were several flights over 2 hours. Two of them were in the same aircraft, Ged and Mike in the Open Cirrus. Trevor had the longest flight of the day at 2 hours and 44 minutes in the Jantar 1. I flew it later taking off just after 4pm and, after initially scratching away, I was astonished by the conditions higher up. 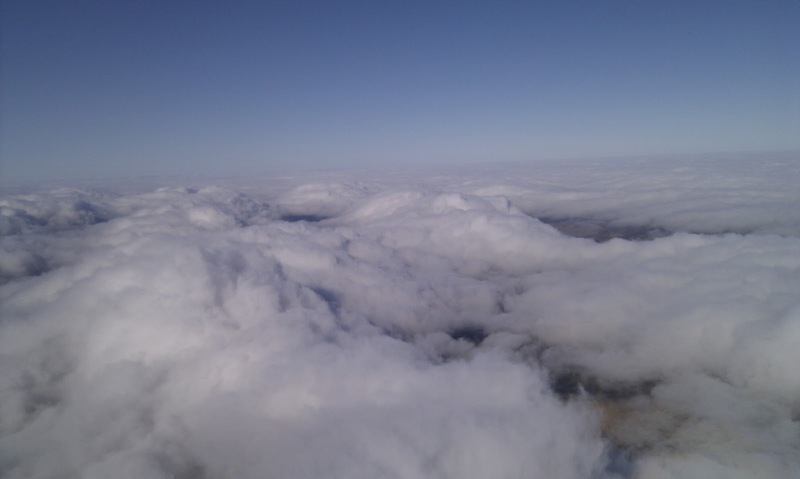 Cloudbase was 5300 feet QNH (above sea level), and returning to the airfield just before 5:30 I had a 5 mile straight run heading north across the easterly wind which showed a 4.7 knot average climb rate the whole way. Probably some wave assistance then. We welcomed new member Jerry Wellington who has joined us via the Fixed rate to Solo scheme. I conducted Jerry’s initial training in the Bocian during a 1 hour 3 minute soaring flight after which he took several flights in the K13 with Don. He progressed well and before the end of the day had completed his first landing. Amazing. New member Jerry looks pleased with himself after an intensive day's flying. Sounding showed complete cloud cover at 4000 feet and so it turned out. 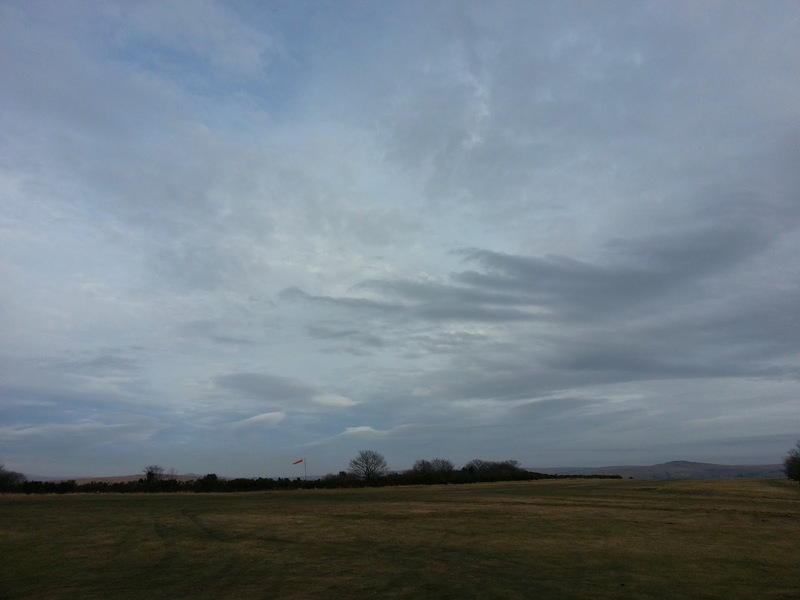 The Sounding also showed an inversion but this was much higher than usual for good wave conditions at Brentor. We did get wave but it was limited to about 1300 feet above the airfield. But this made conditions interesting and meant that the day was soarable for the whole day for the careful, patient pilot. Several pilots managed soaring flights to 30 minutes or so in the weak wave, and a strange wave, thermal, ridge mix that developed later in the day. Great fun ( If you were well insulated from the cold ). So, whilst waiting, it seemed to be a good day to rotate caravans. 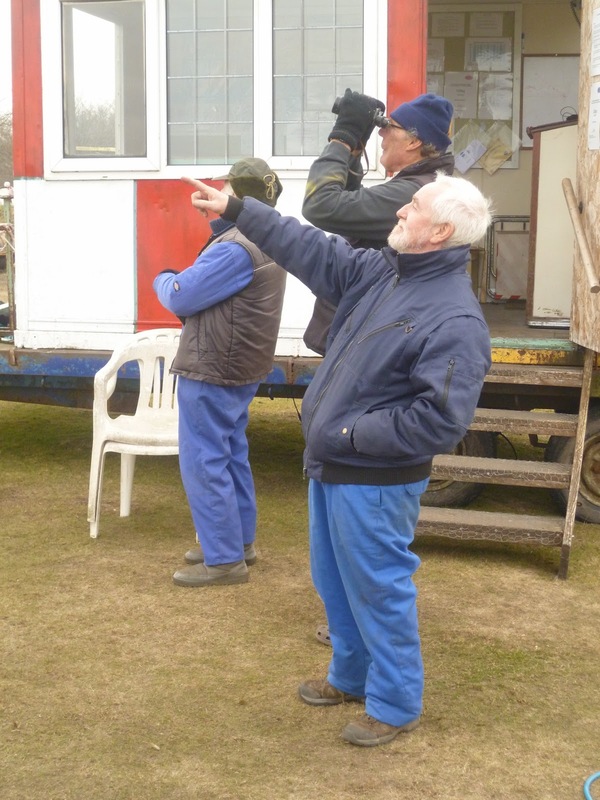 The launch point caravan was given a '90' so that the log-keeper had a better view of the proceedings. Then the CFI's country retreat (another caravan) underwent a '180' so that he can now stagger out of the club-house to his front door with minimal effort. And in case he misses the front door and slips, just to the side are some half-buried tyres to break his fall. Do all clubs look after their CFIs this well? : I doubt it. After all that action and more coffee, a look outside showed the cloud increasing to a dismal, murky grey. So the K13 was brought back to the hangar and fuses and wiring were added to power the new Launch Master transmitter. No idea whether it will actually work but it took three highly-qualified engineers to fit it (so: no it probably won't work) . With the weather now definitely unflyable the decision was made to call it a day and put the toys away. All of this proving that Parkinson's law is as relevant today as it ever was: “Work expands so as to fill the time available for its completion”. 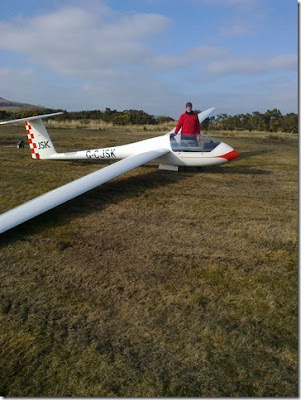 A wind in the east always puts a trip in the step of the Dartmoor glider pilot, however Ged’s parting shot on Saturday evening: ‘I hope the cloudbase doesn’t prove too low for you’ proved, if not a harbinger of actual doom, that he has very good foresight. So whilst the Sunday “Soarers” laid out the cables and got the gliders ready to launch with typical verve and efficiency, their optimism was dashed by a wall-to-wall 400ft cloud base that just sat, and sat, refusing to lift all day. As if proof of the wave were needed, just one very small chink of a slot was seen over the Tavy valley towards the end of the afternoon, but of course totally impractical to reach from a 400ft ‘simulated launch failure’. So to other tasks the team turned, as Darren Wills, with ‘assistance’ from Sandra Buttery and David Jesty, got in some trailer towing practice by reversing the position of the club caravan, ready for Don’s return (the door is now on the downhill side – for whatever reason that might prove useful – ah, yes, access to the clubhouse!) All it needed then was a good hosing down (both inside an out, someone said…) for which there was insufficient garden hose. In the hangar the electronics team (see photo of ‘Hear No Evil, See No Evil, Speak No Evil’) busied themselves wiring in the launch assistant to DMX’s instrument panel (it appeared to work, when Colin Boyd tried the wibers on the correct wire..!). "Hear no evil", "Speak no evil", "See no evil" inspecting electrical connectors. Even Allan Holland turned up, looked at the low cloud, and went home again, whilst Trevor Taylor made use of our ‘NHS helpline’, asking for advice on the wave by phone. Hopefully, the easterly will remain until Wednesday, and not cheat us completely. Wind 8 knots from the east on the ground and 15 knots at flying heights and an analysis of the atmospheric soundings suggested another low level wave day. 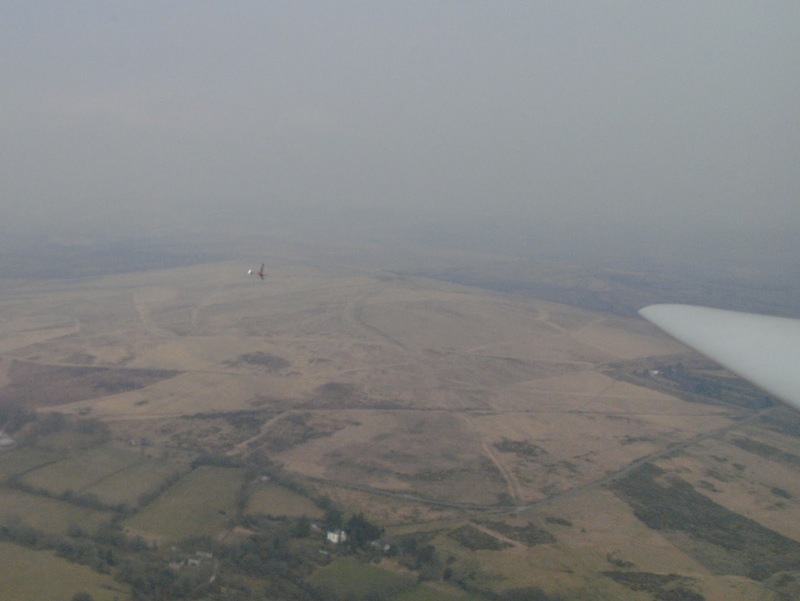 Most of the way from Plymouth to the airfield there was very low cloud but in the Brentor area there were largish areas of blue sky and clear evidence of wave could be seen above. The airfield was very, very quiet. I guess that most members had decided that the torrential rain of the previous two days would have rendered it unflyable. But not a bit of it. The runway was definitely very wet but we decided that we could fly if we were careful. We just about had enough crew to fly and the first 2 flights showed that indeed there was certainly lots of rotor about with sufficient energy to sustain flight. 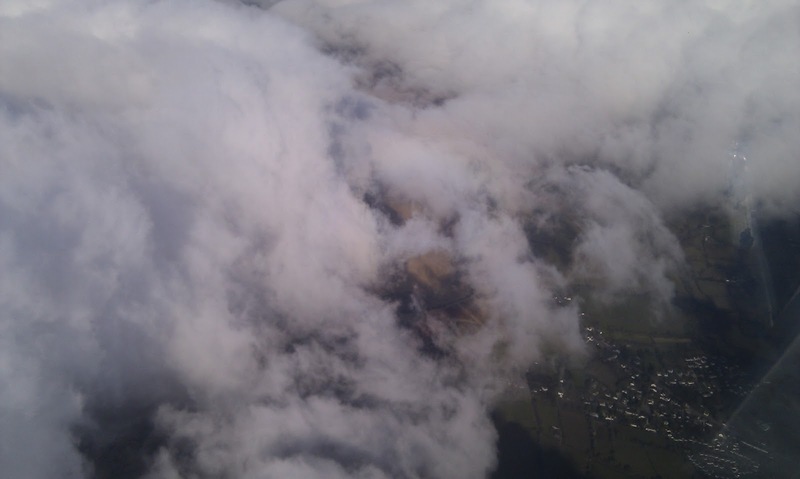 The low level cloud that formed and dissipated in a seemingly random pattern would mean great care would need to be taken to ensure that gliders did not get caught out above the cloud. Two of our number then had to go to the clubhouse for a Committee Meeting, and that unfortunately, ended flying for the day. The day started with very light north westerly breezes and a clear blue sky, altogether a very pleasant spring day. Initially, fights found very smooth air, but out to the west a big line of showers could clearly be seen. 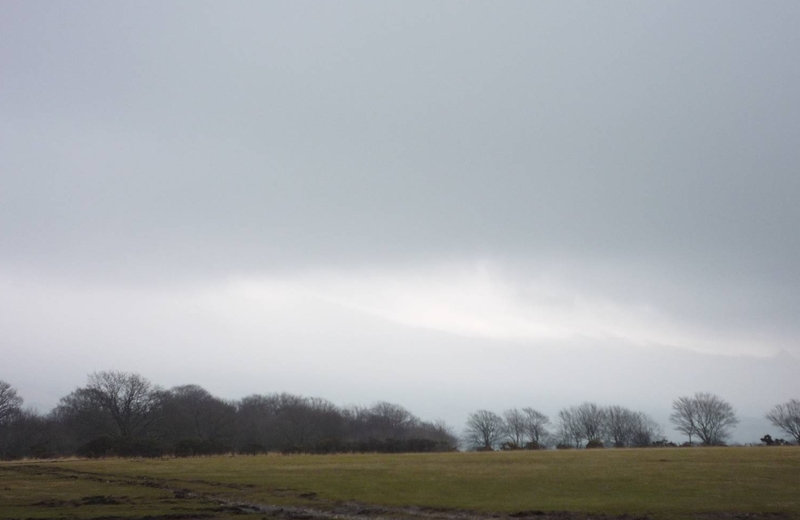 As the line of showers approached there was a large area of sinking air followed by some astonishing thermals. By staying close to the showers, thermal cores giving 5 knot average climbs to 3500 feet were plentiful. This provided great fun for a little while until the showers passed by towards the east. Andrew Beaumont in his Astir timed his launch just right to take advantage of these conditions and ended up with 39 minutes for the longest flight of the day. Andrew only returned to the airfield because the showers were pushing him further and further away to the east and the showers between him and the airfield threatened to cut off his return. 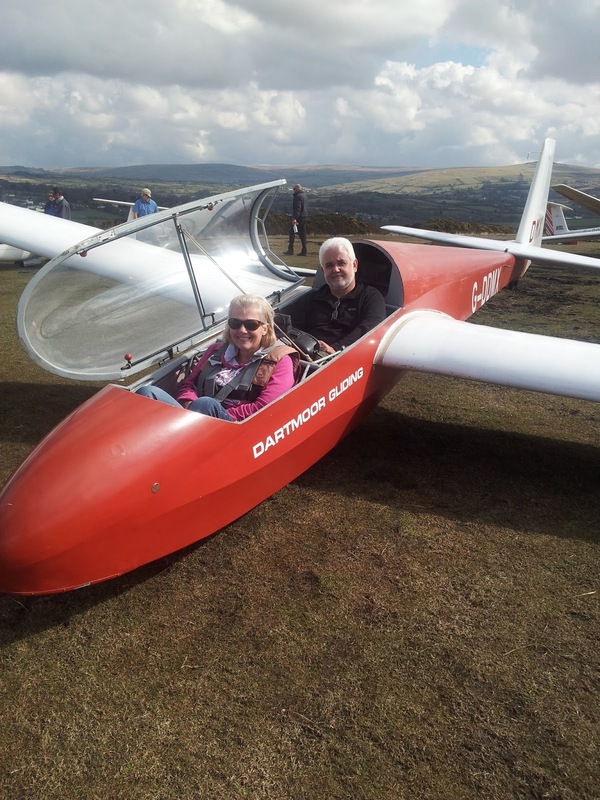 We welcomed visitors Tracey and Mark Stear who were both flying in gliders for the first time. 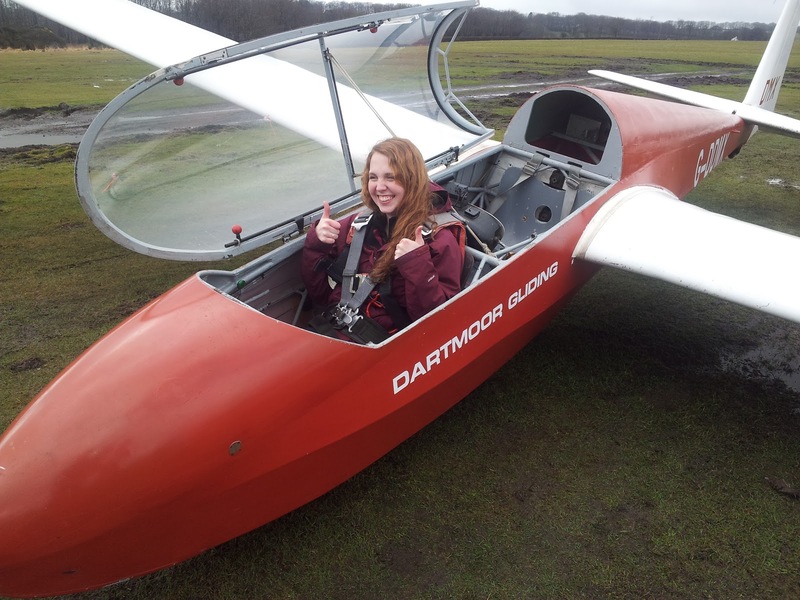 Tracey had a couple of flights followed by Mark who was lucky enough to experience some thermal soaring among the showers. Both of them will be returning for some more flying soon. Although our normal Wednesday instructor Bob couldn’t be with us today, the slack was taken up by instructors Ged and David who kept the K13 busy all day with a mixture of pre and post solo training and check flights. I was interested to see that one of these flights was with Field Treasurer David Rippon who took advantage of the opportunity to start training to fly the K13 from the back seat. Elsewhere on the airfield, the hangar was the usual hive of activity with inspector John Bolt assisted by David Bourchier,Alan Holland and Colin Boyd completing the Zugvogel C of A and ARC renewal after which the aircraft was rigged. A couple of minor tasks remain before this aircraft returns to fleet service. 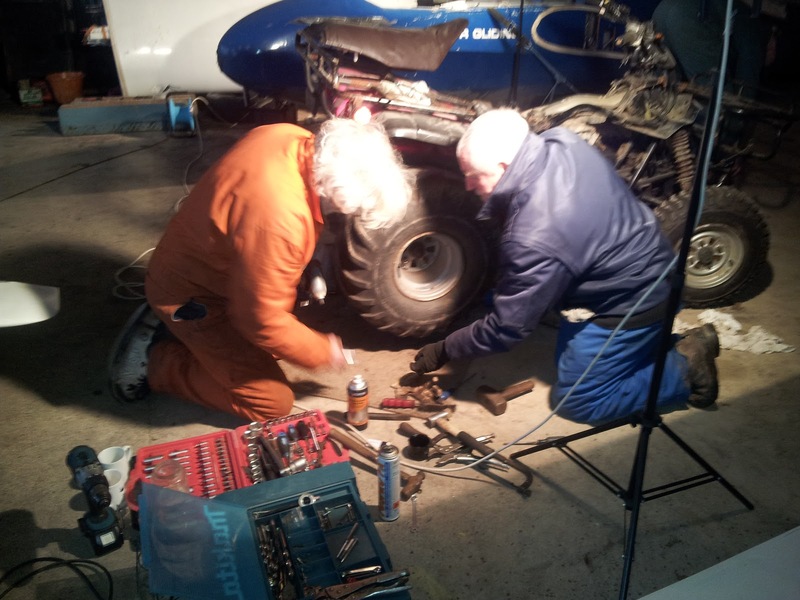 Colin Boyd continued his work on the second Quad bike. This is nearing completion and was used to tow the K8 Open Trailer up to the trailer park after the Zugvogel was unloaded. 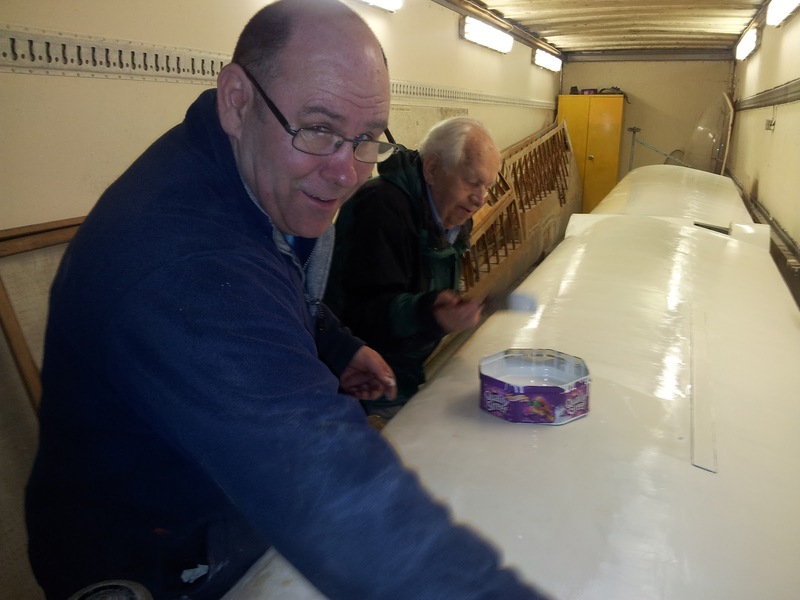 Alan Carter has finally completed sanding the SF27 wings and was last seen applying various layers of dope etc. ready to put new fabric onto the wings. 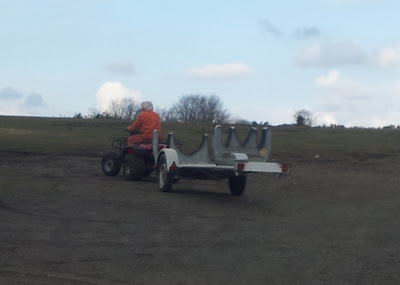 Colin, second quad bike and K8 trailer. After yesterday's horrendous hail showers, a rapidly greying of the sky threatened to make today another washout until, around about 11am, the merest hint of light underneath the sheet to the west gave way to blue sky and the formation of some promising looking clouds. 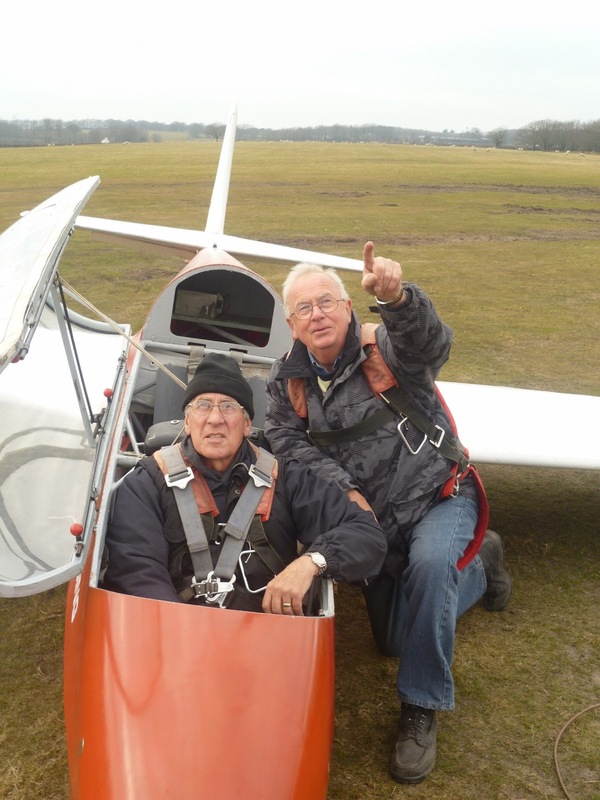 With 2 trial lessons in prospect and a clutch of club members keen to stay current, the instructing team of David Jesty and Mike Sloggett were keen to meet those needs whilst minimising movement and damage to the rain sodden areas of the airfield. And indeed both Amira Conley Conversi, from Plymouth and Douglas Graham from Okehampton enjoyed their flights, leaving the increasingly promising sky clear for the home punters to make their mark. Or not - for whist Richard Clark made great strides in his progress to solo and Sam Deeks was savoured the benefits of silent flight, other club members, attempting to make an impact on the Log Sheet with the K-8, frustratingly failed to find anything beneath the clouds. That is until the appearance, from the hangar, like a wraith, of 'White Finger' - the man with the Golden Drum - ming Wrist, Alan Carter, who calmly clambered into the K-8 and promptly took it to 1400ft for 14 minutes - in the blue! Some people have all the luck! 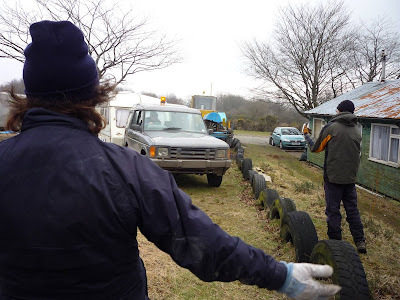 Some useful winch training/driving was also achieved by Darren Wills and Roger Green, thanks guys. Quote of the day has to go to David Jesty: 'If the clouds are supposed to indicate rising air, how come the sky seemed to be just full of - SINK! 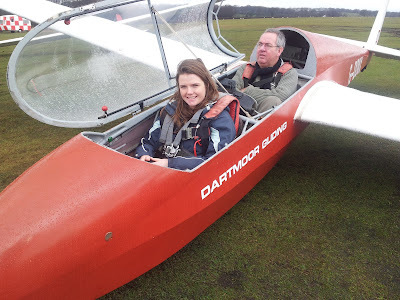 After an initial pitch inspection to confirm that the field (although very soggy) was usable, the decision was made to employ just one two-seater and one single-seater to minimise damage to the launch area. 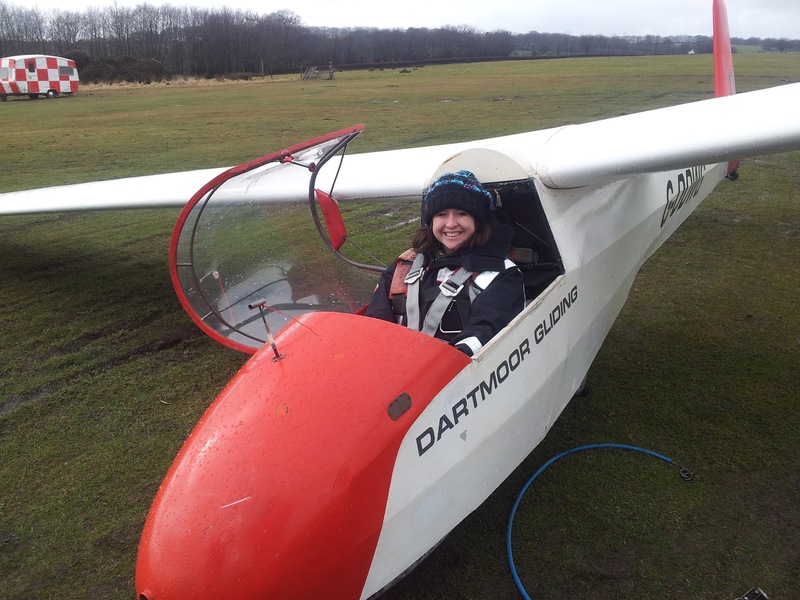 As soon as the gliders were DI'd and ready to go the skies darkened and further rain fell. So after an hour's delay the weather improved considerably and flying commenced. Richard Clarke quickly de-rusted his flying after a long period of absence. He was then introduced to the delights of launch failures. Various other members kept current with quick flights. Despite the very promising-looking sky nobody could find any usable thermals until, strangely- very late in the day, at about 16:40 when Alan Carter managed to get a 14 minute soaring flight. Mike Sloggett flew two trial lessons with Douglas Graham and Amira Conley-Conversi. and Martin Cropper helped with the instructor workload despite being a 'day off' for him. Thanks to all who helped in what turned out to be a very pleasant day in the spring sunshine. Low cloud, very frequent showers, some thunder and hail made this a no flying day. The assembled members got on with a breathtaking range of tasks. Martin Smith worked on K7M G-BVB hoping to finish it’s C of A soon. Martin at work on BVB. The trimmer circuit was the focus today. Rick Wiles and Victor England painted the Pirat wing after a group effort managed to start the ex Perranporth generator to power a couple of heaters to make the workshop suitable for painting duties. Sandra replaced the floor tiles in the ladies toilet. 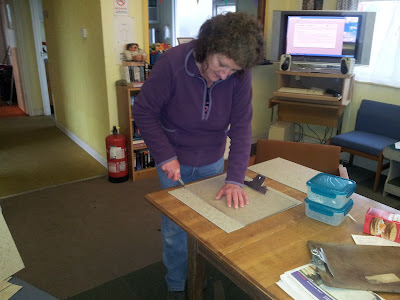 Does Sandra look safe with that craft knife? Really? 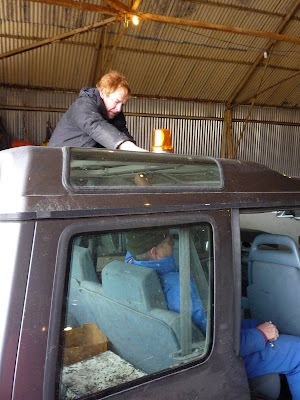 Another group effort saw the door locks on two of the Landrovers fixed – this has been an annoyance for their drivers for some time. 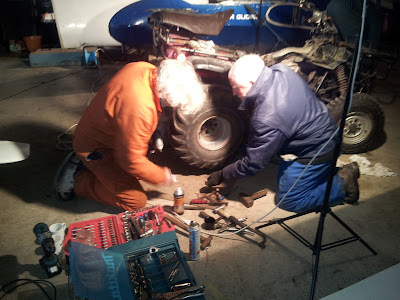 Colin Boyd worked the second quad bike with Ged and Rick. This bike has been gradually rebuilt from what can only be described as “scrap condition”. It now runs, the front end of the frame has been replaced, it sports a new exhaust and subject to a brake rebuilt and a couple of tyres it will be in service soon. It even looks like a quad bike now. A touch of west in the brisk northerly crosswind stimulated a smoothly-executed change of ends by the early morning team. The east end launch point itself was refreshingly mud-free - and smoother than it has been for months thanks to the efforts of Phil the Farmer and others with tractor and roller. The south side landing area well up the field seems to be 'lumpier' than ever, however. So I urge all pilots to 'walk the course' whenever they intend flying in order to familiarise themselves with preferred ground runs - and fall-back alternatives if those are blocked. 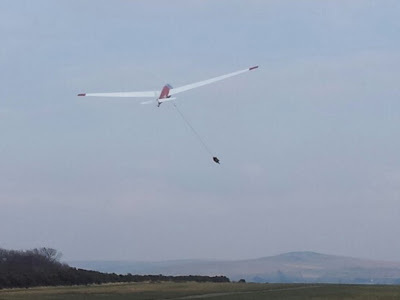 The biggest worry, however, continues to be the centre track - as ever a 'no go' area for gliders, but now offering serious potential for destroying Land Rover Discovery suspension systems. Flying-wise we enjoyed a 'bracing' day of crosswind combined with sunshine and some heavy sleet showers, with the the small team present multi-tasking between flying and launching and retrieving each other. In the hangar work continued on the club K7/13 and privately-owned SF renovations, while the Zugvogel remains poised (on its trailer) ready for its annual inspection. Louis Basquill ready to fly. A special thank you today to Mike Keller, our unsung hero of the trial lesson booking system, who replaced comfortable winter hibernation with a freezing day manning the control tower. With four instructors, several solo pilots and trial lesson visitor Louis Basquill present, everyone got all the flying they could have wished for given the conditions. Not much in the way of soaring, but plenty of launch failures and approaches to the stub runway. 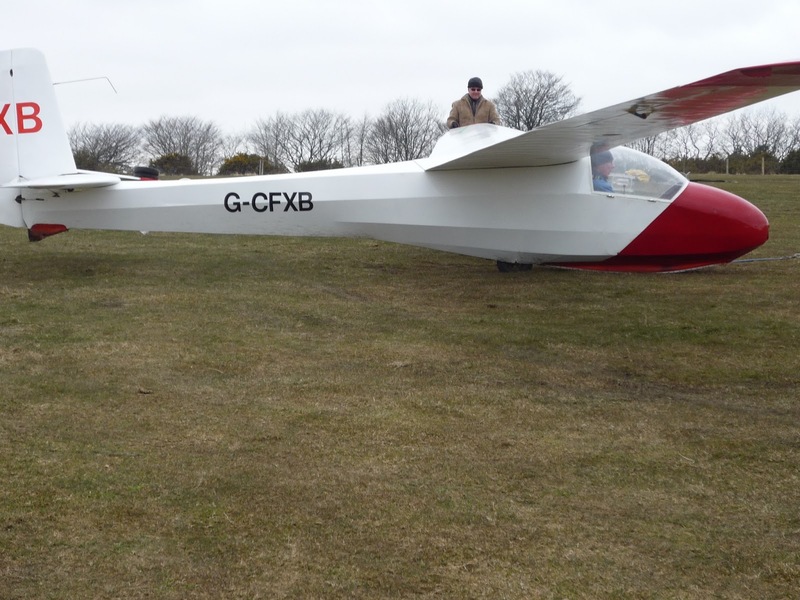 Gliders in use were K13 DMX, the K8, the "Philanderers'" Astir* and - later in the day - the Twin Astir. Activities concluded on a high note (sort of), with the Twin and single Astirs as well as the K8 all airborne simultaneously and sharing the only decent thermal of the day - before conditions died completely. A chilly brisk wind from the NNW and a grey looking sky did nothing to deter the Wednesday faithful. They were determined to fly. Most of the flights today were about gaining or maintaining currency. We welcomed visitor Loius Basquill who had a couple a short but enjoyable flights with me. Apart from the club K13 and K8, Phil and Andrew flew their Astir and later Phil and Ged got the Twin Astir from it’s hangar. Towards the end of the afternoon there was a period when a thermal made a brief appearance and those left on the ground were treated to the sight of the Twin Astir, the K13 and K8 turning tight circles together. 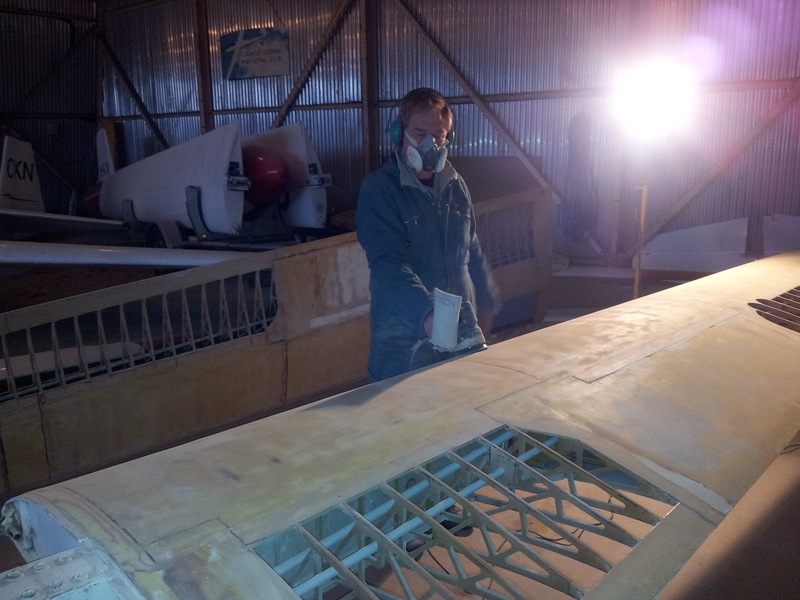 Elsewhere on the airfield Alan continues his sanding of the SF27. ( I think painting the Forth Bridge would have been an easier task.) Trevor arrived ( no, not because he expected great flying conditions ) to check out the electronics on the Jantar. He spent several hours checking through all the wiring and connections but could not find the reason for the GPS not talking to the LX4000 flight computer. I turned up to help, (it is my aircraft as well), and immediately realised that it was a software issue. Five minutes later, I had reset the GPS data type and hey presto, all the systems started to work correctly. If you are wondering what the LX4000 does; it is an extremely good variometer system complete with averager; it supplies all the navigation data; wind direction and strength; it monitors the glide angle and the height required ( or surplus ) to reach the next turnpoint, and provides speed to fly information. 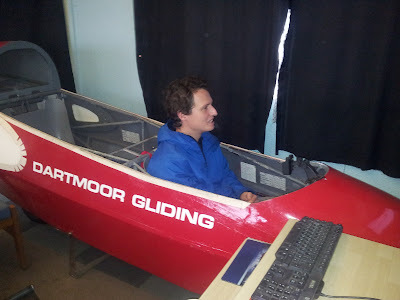 Sometimes, I think that if we connected it to the controls, it could happily go gliding without the pilot!! 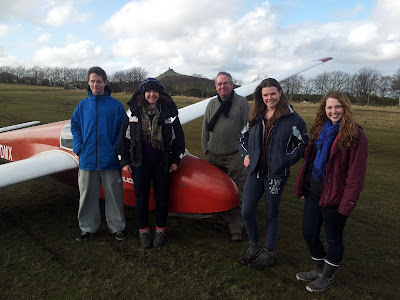 The Challenge Trophy, presented to the BGA by the Air League to reward excellence in gliding instructing, has not been awarded for a number of years. 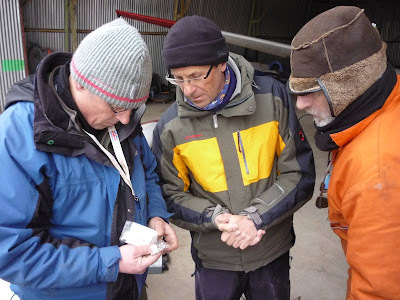 For 2012 the BGA decided to make the award for the highest number of Licences (Bronze Certificates with Cross Country endorsements) in any one gliding club, using a per instructor calculation. DGS beat all the other clubs to carry off the trophy. Runners up were the Army Gliding Club in Germany who were beaten by 1! So the honours go to everyone who worked hard at DGS to gain such a good result with the unexpected bonus of the Challenge Trophy award for 2012, but special congratulations to that small group of hard working and dedicated instructors who nurtured, encouraged and cajoled club members to achieve this result. It was collected at the BGA AGM Awards Dinner on 2nd March and presented by Andrew Brooks of the Air League who gave a short history in his preamble to presenting the award (during which he congratulated DGS on their achievement and mentioned that a previous presenter of the award was a certain Mr Profumo-of some notoriety). 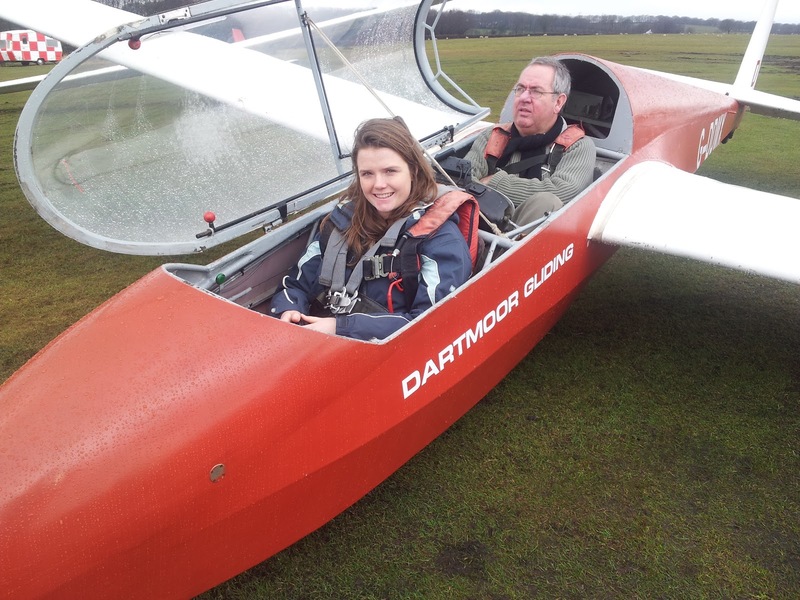 The trophy will be on show at the DGS AGM on 6th April where we hope to have a small celebration to mark the historic occasion of DGS’s very first national gliding award. For those who would like to know more about the Air League the link is: www.airleague.co.uk. For once the weather performed as forecast: howling winds and lashing rain put paid to any outdoor activities, let alone flying. Meanwhile the incessant drone of the sander accompanied Alan Carter's efforts to create an escape tunnel through the wings of his SF-27, whilst Barry, Roger and Heather prepared the Foka for its sojourn to the Mynd. My attempt at a soaring forecast for today ( mixture of Met office, RASP, reading the atmospheric soundings and seaweed out of the window ), suggested light south easterly with little or no chance of wave or wave influence, possible local soaring during any gaps in the cloud cover in the moist airflow. In practice when the clearances came the sun angle was already too low to be of much help. Several flights saw the teasing beginnings of thermal activity and the longest flight turned out to be a disappointing 12 minutes. Was this a wasted day? Not a bit of it. We welcomed a visiting group from Plymouth University organised by Sarah Reed and Mike Sloggett. Early on there was a lot of showers. So, after the various briefings by Mike, we settled into the clubhouse to give are visitors their initial controls lessons using the simulator. As soon as the rain had abated we moved up to the airfield where there K13 sat just waiting to be flown. Mike started flying our visitors in rotation ( just in case the weather closed in ). Ged and I helped his efforts towards the end. Meanwhile Sarah took a couple of launches in the K8 to help maintain her currency. After a little flying by club members it was all over. The gliders were returned to the hangar and we retired to the clubhouse for an end of day can of beer. A fun and productive day. Check of the forecast the night before spurred me on. A wet air mass bringing low cloud and light rain, typical Wednesday, so I loaded the land rover with gate posts, spades, iron bars, fencing equipment and astir repair tools for the challenging day ahead. 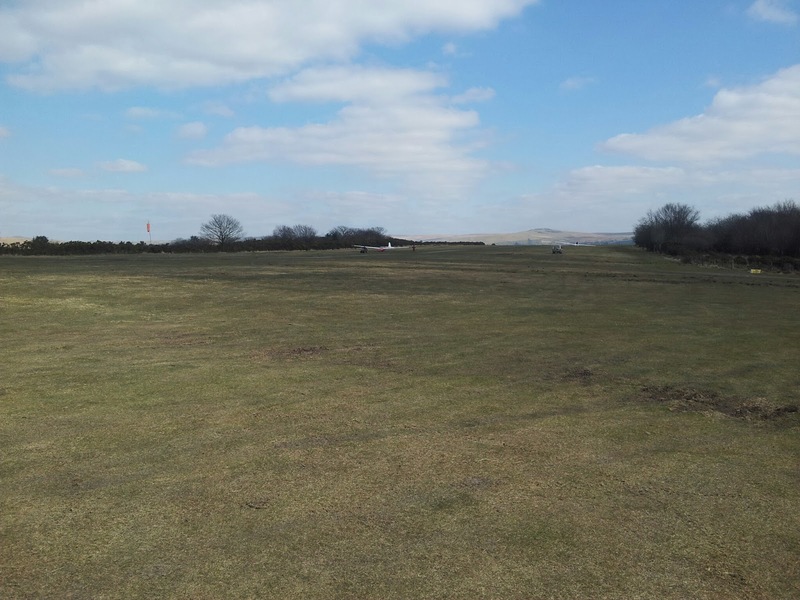 When I arrived at Brentor there was a higher than expected cloud base and a brisk south east wind, it looked good but we knew it would only last till the first launch, and distract us from the real business of the day. But the wings went on...... just in case! Bob Pirie’s first launch of the day said it all . For a small fee Ged agreed that Andrew would need another flight check.... so the stage was set. A fast and exciting launch not too high but the wave felt like it was tugging me up and willing me to come and play. The first hour was exactly that. Going where I wanted, when I wanted and always finding lift somewhere but never over 2500 feet. The second hour was spent trying to preserve the height I had, I stayed with a familiar line of energy from just off the east end of the runway, to the east of Tavistock, 0.2 up on the averager on the beats and down 0.4 on the turns. With no mistakes I would have kept the height but movements in the wave bar, turning too soon or to late all contributed to a decline of over a thousand feet in that hour. Then the descent was over, the lift increased and I was climbing again, although I never felt I could take the risk of leaving the track I was now very used to. The sky filled with the available aircraft as the club now seemed to have cleared the cable break practices and got geared up to fly. Andrew called me on the Radio and encouraged me to try and get the 5 hours and then it got more serious. They all seemed to out climb me in every direction as they toured the countryside for miles around but I just kept plodding along my track and conserving any height I had. If there is an easy way of getting your 5 hours this must be it, steady lift and airfield at your feet. No navigation, picking fields, or airways to avoid. (In fact I think the Astir may have flown better while I was having lunch). A great Day easier and better than I dared imagine; you should all try it. 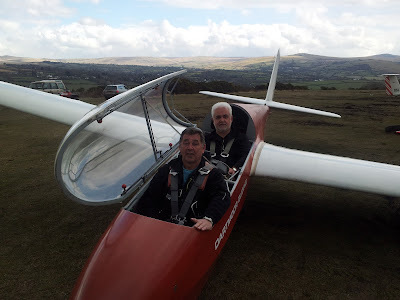 My thanks must go to Andrew for his generosity with the glider, the members of the club who made it possible, and particularly Don`s master class in wave flying I received at Talgarth which helped keep the string straight.. ish. In contrast to the Club's recent run of winter Wednesdays with gale force winds, rain, snow and boot-topping mud (whenever the temperature crept above zero, that is), today turned out to be a corker. Undeterred by rain and low cloud encountered during their early morning journeys from various parts of the peninsula, the small group of regulars who made it to the club were rewarded 'in spades' with a dry airfield and 'wall-to-wall' wave from mid-morning through to about 1700 hours. Twelve hours of flying time were achieved from 17 launches (some of which were simulated launch failures) by just four gliders; with the spoils of our day including one five hour flight to complete a Silver C badge, a flight of two hours to complete a cross country endorsement, and three solo pilots well and truly 'refreshed' after winter lay-offs, as well as several pilots enjoying flights of half an hour or more - just for the fun of it. The day started with the wind blowing more from the south than the forecast southeast, 10/10ths high cloud cover, and at a lower level signs of lenticular activity developing. 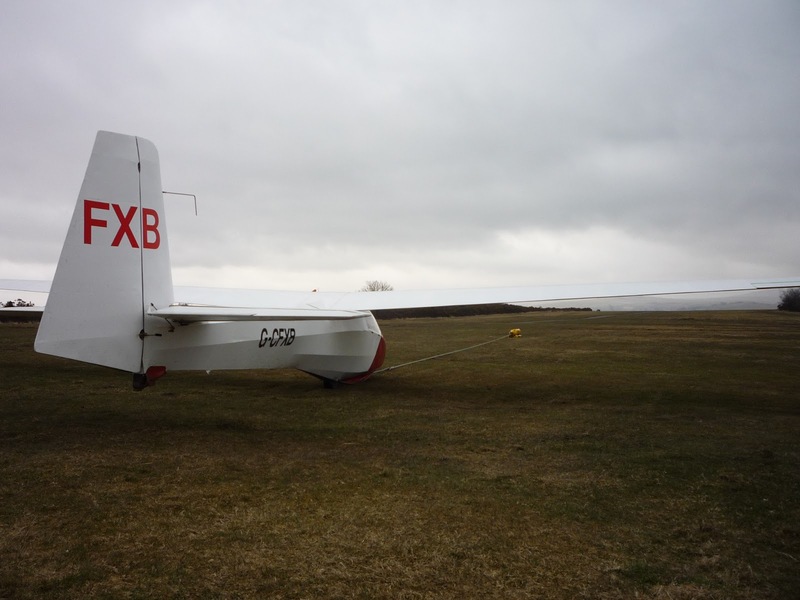 With the 'early gang' having set up the airfield, and K13 DMX parked and ready for the 'off' at the launch point, the emphasis switched to rigging gliders. 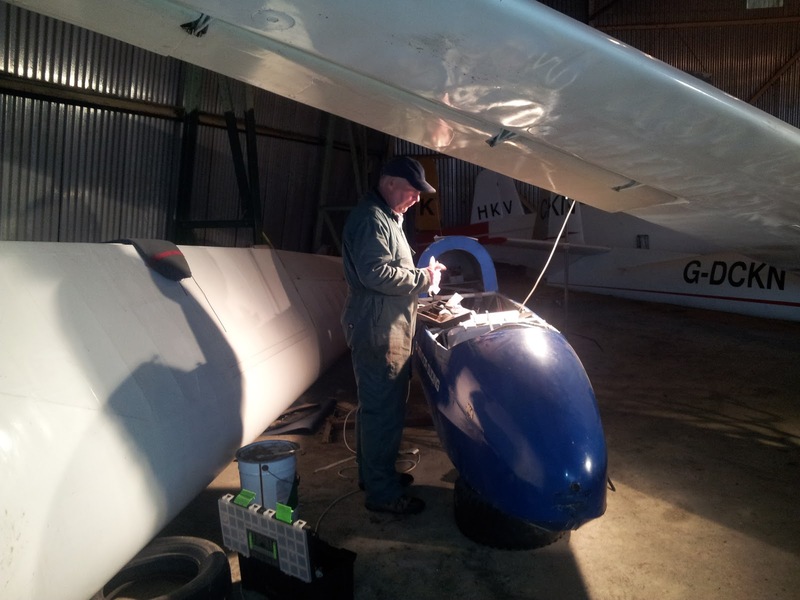 First of all Barry Green (accompanied by Heather), having landed out on Sunday, led the rigging of the K8, while Phil the Farmer and Andrew Beaumont, and Mike Gadd and Ged Nevisky, respectively, set about rigging the Astir and Open Cirrus. Instructor Bob points the way for a 'refreshed' John Howe. Meanwhile as duty instructor, I thought I would be failing in my duty were I not to inspect the launch point, sniff the air, and test the conditions in the K13. So after the first launch of the day - signalling 'too fast' for most of the way up due to a marked increase in wind with altitude - I released at 1200 feet in zero sink, which after about 15 minutes of searching, developed into useable wave which wafted me up to 1900 feet. 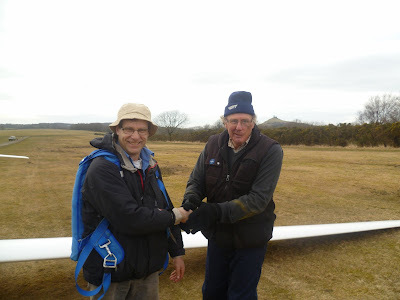 I then loitered to provide a marker for the next glider to launch - Phil in the Astir - who established himself immediately, while I landed to start a day's instructing. 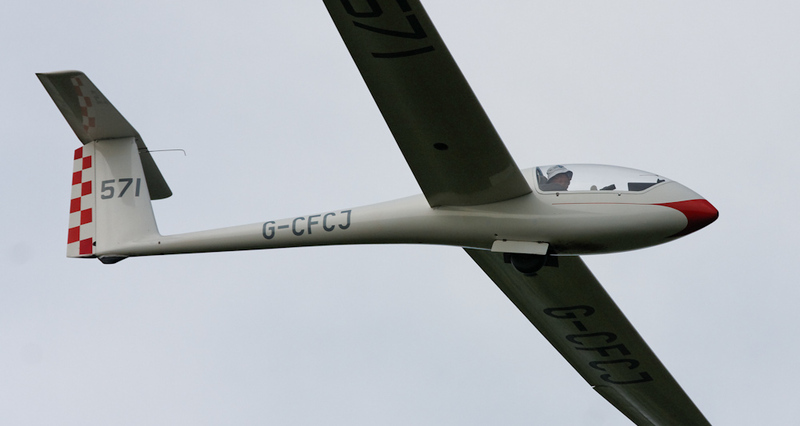 A little later Mike (followed by Ged) went soaring in the Open Cirrus, as well as various solo pilots sharing the K8. Is it an Astir or a Cirrus? With the low level and variable consistency of the wave, today was not an obvious one for badge flight, but as we watched with bated breath, the Astir maintained its place at the 'top of the heap' until late in the afternoon, just as the wave was dying, Phil returned to base with five hours plus a margin for error in the bag - mostly flown at not much higher than 2000 feet. We were all delighted not only for Phil, but also because he was the first Brentor-trained pilot for several years to have completed all of his Silver C legs from our site. Astir syndicate partner Andrew Beaumont congratulates 'Five Hour Phil'. 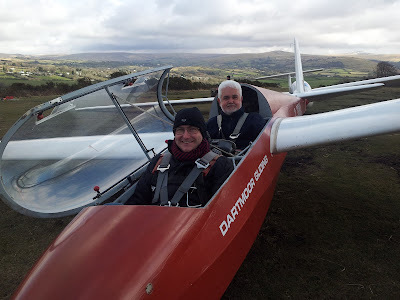 The two-hour flight to complete his Cross Country Endorsement was achieved by Mike in the Open Cirrus, for whom now have great expectations when he flies the DGS flag at the Inter Club League competition. Mike Gadd in the Open Cirrus tracking south at 2400 feet QFE and still climbing (just). I am sure you will all join me in congratulating both of these dedicated pilots and club members. By late afternoon, and well before sunset, we had all 'filled our boots' with flying, so the kit was put away in a leisurely fashion and celebratory cans of beer were consumed around the wood burner. Smiles all round! Instructor Ged (left) congratulates syndicate partner Mike, while Bob (right) congratulates Phil (whom he sent solo four years ago). 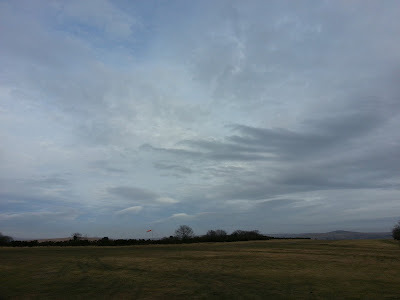 Wave was clearly forming but the cloudbase was low, approx 1000 feet QFE ( height above airfield ) and little blue sky was showing. Martin launched with Wynn, a visitor from North Hill. The K13 disappeared from view as it climbed in front of the wave bar. The K8 was launched only to contact cloud well below 1000 feet. I eventually had a launch in the Zugvogel as there was some blue in the slots, found only turbulence, from 6 to 8 up, then EXTREME down. If you have flown the Zugvogel you will know that the vario sink audio sounds like the Knell Of Doom, and I was soon returned to Terra Firma. Trevor,with his 19 metres of supership, said I had not penetrated far enough forward. Maybe he was right, my wave experience is limited!!! A little later,after a bite of lunch, things looked a little better. Alan Holland,who was in the control tower, urged me to go again. so I said ,"I will bring it back in a half hour or so". The launch was not good. I only got 870 feet QFE, probably due to suppression by the wave. However, remembering Trevor’s advice, I pushed forward to be rewarded with broken lift. Gradually it became more defined until the vario began screaming with the needle hard against the upper stop. This is good, I thought, I`ll have more. 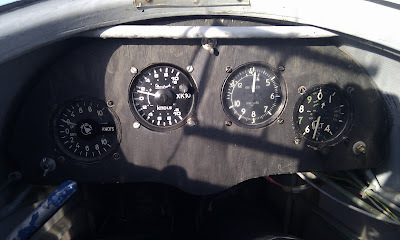 It was possible at this time to have used the altimeter as a vario so rapidly did the needle move. The view through the gaps was a little limited. All of this time I had in mind Alan Holland’s last words,"Keep Mary Tavy in view as a fix". I could not see Mary Tavy but I could clearly see the edge of Black Down and I determined it would have to do (mistake!!). All this time the Zugvogel is climbing merrily,and as I passed through 4000 feet. 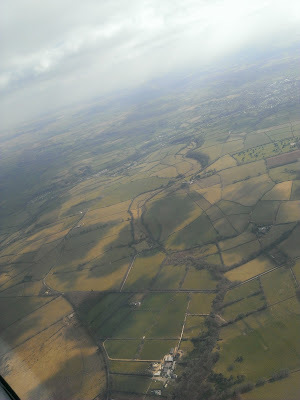 QFE, I began to see that the view below was somewhat limited, BUT I could still see Black Down. All is well I thought. Upwind towards the next wave bar. A glance at my watch showed 25 minutes elapsed. Time to get the Zugvogel back for Alan. The lift was still extreme and I had full airbrake plus spiral to get down quickly. I was careful not to get drifted into the wave cloud as I descended past them, very turbulent in there!! Finally my view extended as I got lower, though very hazy. Looking to where I fully expected to see Brentor Church and our field but I recognised nothing. Sh--ugar, I thought, calm down, plenty of landable fields, should they become needed. I finally realised that I was to the West of Lydford. How could that be? Back to the matter in hand, how far can I get toward Brentor? Cruising forward all is going well no lift but I am in zeroes. However as I flew above the Lydford valley big sink got me. Should I turn and land to the west? or try to sneak across? I could see several landable fields on the Eastern upslope ahead,and as I prefer to land upslope the decision was made to press on. I thought, as I approached, that the landing would be in the field alongside the minor road twixt Lydford and Brentor,but as I approached it became evident this would have been marginal. 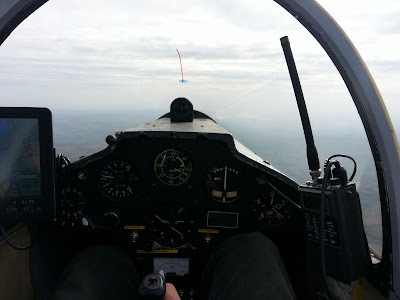 So nose down, airbrake open, lots of speed to round out up into the considerable upslope of my undershoot field. A very short ground run. A sigh of relief. Too soon, however, for as I relaxed the glider,still wings level,began to roll backwards, the ground,once soft,now firm was not a help,the roll went on for approx. 40 yards with me pulling on the airbrake lever.The wheel brake did help.I think,and she finally came to rest. Getting out of the Zugvogel was the usual struggle.The retrieve that followed was also a struggle but thanks to Collins van and willing helpers it was accomplished AOK. I had to apologise to Alan, as he had missed his flight, but he was very gracious. The retrieve, later on, of the K8 from the boondocks, in the dark, with a strong ice cold wind is another "Tale for the Bar". The night view of Orion and bright stars made it almost worthwhile. With just time for a rasher of Western Zoyland’s finest Somerset Black Spot, encased between 2 of slices of Lidl’s brown doorstopper and a slurp of back coffee, the arrival of a visitor from North Hill gave cause for suspicion. ‘Just a check flight..?’ enquired Wynn Davies. ‘Why?’ thought I, before he was engulfed by tales of Welshness from Barry Green. With Nigel Williamson and Darren Wills on hand to provide the necessary winch and cables, at 1040 we took a launch. Within 5 minutes we were at 3,500ft, the variometer having been kick-started like a 2-stroke motorbike and Wynn stunned by the breathtaking beauty of a sun drenched carpet of white cloud white cloud all round, with the exception of two thin streaks of earth that were visible running N-S across the site. And maintaining sight of the ground and positional awareness were to prove to be the watchwords for today. Back down on the ground 37 minutes later the prospects did not look so good: ‘messy’ was how Roger Appleboom described it after a 7 minute fling in the K-8; the cloudbase extensive with just hints of light suggesting where any lift might be. So to wait. Henry Ford and his girlfriend Andria, turned up, also from North Hill – ‘Just a check flight..?’ he enquires (are we on some sort of migratory route?) As lunchtime approached so did Trevor Taylor, and a little later (he is now able to keep gentleman’s time) Allan Holland – so by now it was clear that this was meant to be some sort of wave day. And with Wynn Davies’s second ‘just a check flight’, whisking us to 4,500ft over Blackdown, so it proved. The primary wave set itself up a leap of faith away to the east of the River Tavy, whilst a secondary band stretched across the airfield, and a smaller, but no less active, tertiary band in line with the church/road and base leg! 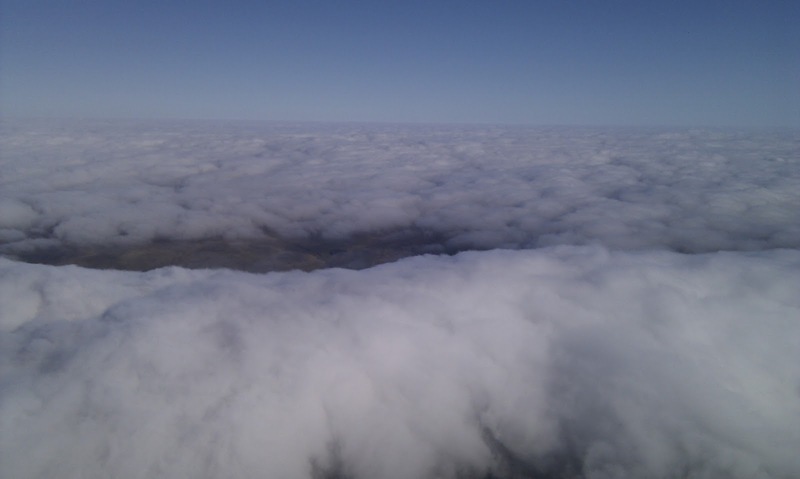 Climbing to 3,000ft plus proved easy to windward of the clouds, which could be seen surging up and plunging with great ferocity; there were also sweet spots in the clear where 3-4kts took us to 5,500ft plus. Roger Appleboom hopefully achieved Silver height and Nigel Williamson one of his 2hr legs for Cross-country Endorsement. Trevor Taylor disappeared for 2 hrs. The wind must have veered with height, however, for two of the single-seaters found themselves further north than anticipated when descending through the wave slots: both landed out safely between Lydford and Bridestowe but the lesson is clear – keeping sight of the slot, and maintaining a thorough check of one’s geographical position is a vital part of the enjoyment of wave. So whilst the vario is tootling away like James Galway’s flute, keep a good lookout and clear view of your exit route, whilst testing your understanding of the ground features below. Nigel has already sent his thanks to all concerned with his retrieve, to which a paean must be added to Allan Holland for the calm, knowledgeable and patient manner in which he led the move of the K-8 onto the K-13 trailer, in gathering darkness at the end of a long day. 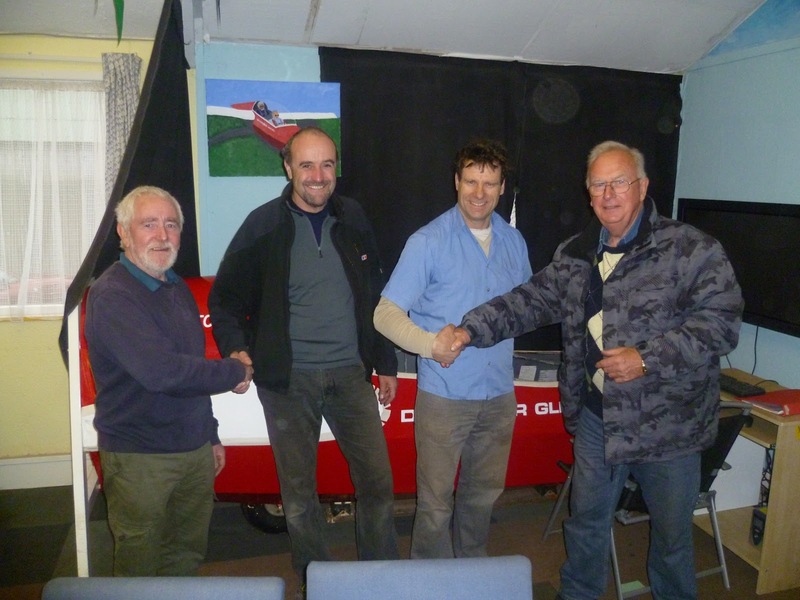 And also to Colin Boyd for earlier having done the same with the Zugvogel, and finally to the two retrieve crews for their great teamwork – that’s gliding. The day started with an overcast sky and light northeast winds and it was COLD. Matthew Wiles made the early running with a couple of flights in the K8 before he exiled himself to the winch for the rest of the day to finish his A level assignments in between supplying great launches. Thanks Matt. Matthew seems well rapped up against the biting cold. 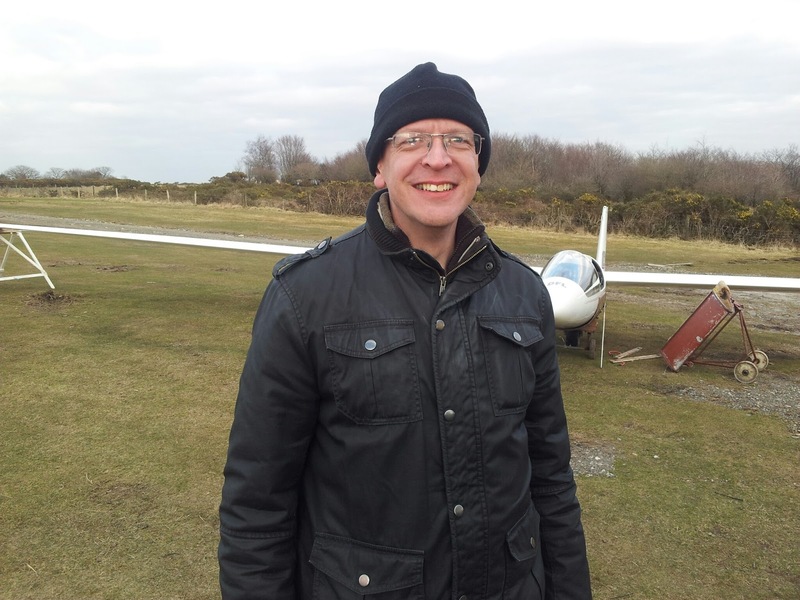 Steve Raine had a practice cable break with instructor Ged before he had his first flights in his new Astir share. He has been very patiently waiting for the weather to improve and today he got his reward. Steve and his "new" Astir share. By early afternoon the cloud cover had largely disappeared and suddenly we were soaring in lovely Spring thermals. Pilots were reporting some fairly strong cores to a cloudbase of about 2000 feet above the airfield. 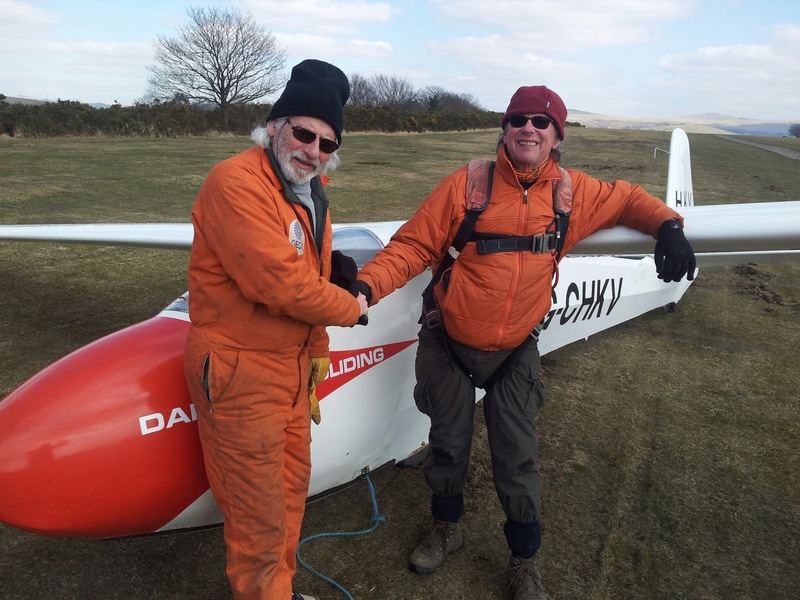 Mike Gadd flew his Open Cirrus and managed 1 hour and 8 minutes before he missed a thermal and had to land only to watch his syndicate partner Ged launch and soar for another 1 hour and 5 minutes. You might think this a nice way to share the aircraft but remember Mike needs a 2 hour flight to complete his cross country endorsement. Better luck next time. We had a young visitor James from Bodmin who was keen to experience gliding. 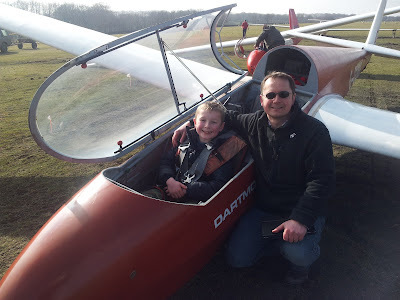 He had a great time flying with me in the K13 as we soared amongst the other gliders and the buzzards that were enjoying the day as much as we were. Excellent. A roaring log fire greeted us at the Blacksmiths Arms in Lamerton as we gathered for the "end of the monsoon bash"
While everyone enjoyed a few pre-dinner drinks at the bar, I busied myself selling everyone some raffle tickets! Most of the prizes were bought with funds left over from the last open day draw, so the money is going back into the pot to buy some much needed new chairs for the launch point. 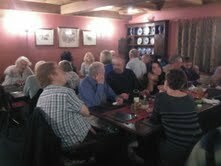 The food was good and the company excellent, it was so nice to meet and chat to Wives and Partners. The evening was rounded off with a bit of fun and laughter with the prize draw. Thank you to everyone for a very enjoyable evening.